The Cabo Palace in Goa is one of the ancient buildings in Goa that depicts the glory of pride of this small Indian state. The palace was built in 1540 AD opposite to the Fort Aguada. It is situated on the south headland of the river Mandovi. This Portuguese Palace fortress houses the Franciscan monastery, which later on (1594 AD) became the official abode of the Governor of Goa. This citadel holds the most panoramic sight one can onlook in Goa with the Bay of the river Mandovi and Fort Aguada on the north, the Indian Ocean towards the west and the busy port of Mormugao. The palace is unhabitated and inaccessible for centuries. People living here believe that some human habitat must have been present over here but due to its enclosed space in the dense backwoods, no signs of previous settlements are found. 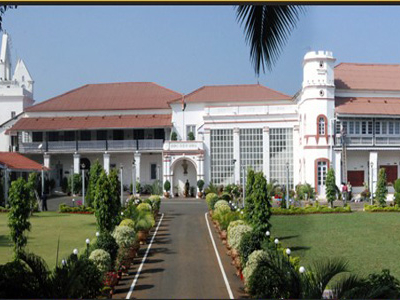 Here's the our members favorite photos of "Palaces near Candolim". Upload your photo of The Cabo Palace! Raj Francis is the only Touristlink member to visit The Cabo Palace. Have you been here? Click here to save it.